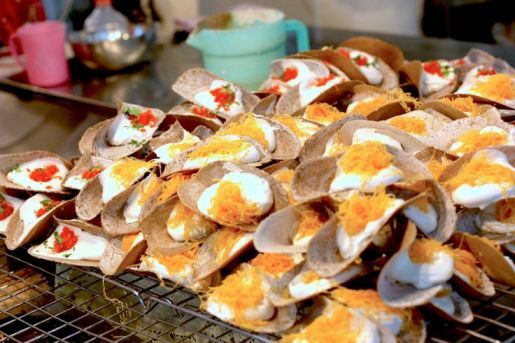 Bangkok is famous all over the world for its street food. Check our list below and find your favorite ones! 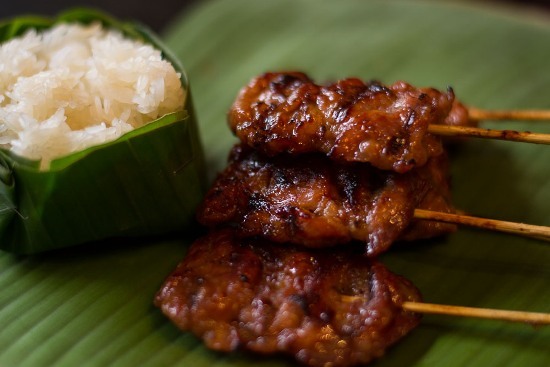 It is the unique marinate and batter that make Thai fried chicken so addictive and delicious. You can easily find fried chicken stalls nearby Pratunam area. Pork is grilled on traditional charcoal, using the amber and heat until it is well cooked. A delicious Moo Ping is sweet, succulent and tender. The stall of Moo Ping Hea Owen is recommended by many locals but you can still find good ones around even in Pratunam Market. It is lightly crisp on the outside and airy soft on the inside. Does the description give you a bouncy feel? 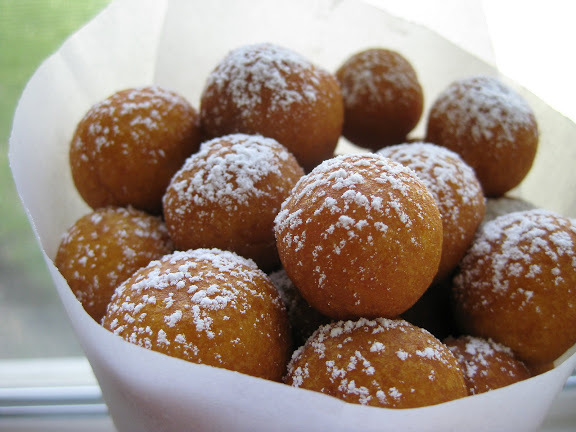 It’s so delicious that you can’t stop at just one ball. Pandan sweetmeat is a healthy snack as it is not fried. This pandan kueh is warm, soft and chewy with a sponge-like pillow texture. You must eat this immediately after purchasing to enjoy its best taste. Pork is marinated with honey and many other spices then grilled on charcoal. All the flavors are retained in the meat, making it sweet, soft and tender. You can even order a bun to go with it. Banana Prata is a sweet snack usually topped with condensed milk. However, if you don’t like condensed milk, there are several options for your choice including honey, nutella, chocolate, coconut, sugar and much more. There are many kinds of crepe to savor your taste, crispy, soft, hot and cold crepes, with a variety of toppings. These waffles are small in portion but just enough for you as a snack. They are crunchy on the outside and soft on the inside with lots of choice for fillings such as chocolate, cream or maple. Pad Thai is like the national noodle of Thailand because every noodle dish ordered from a Thai Restaurant would be Pad Thai. It is a street food dish made from stir-fried rice noodles with egg, bean sprouts, peanuts, shallots, tofu, prawns and tamarind juice/sauce. Pad Thai is just simply sweet, spicy, tangy and extremely delicious. I will recommend you 2 places for Pad Thai. Tom Yum Goong is the national soup of Thailand and mixing it together with the popular Thai Rice Noodles, it becomes a double-hit combo. 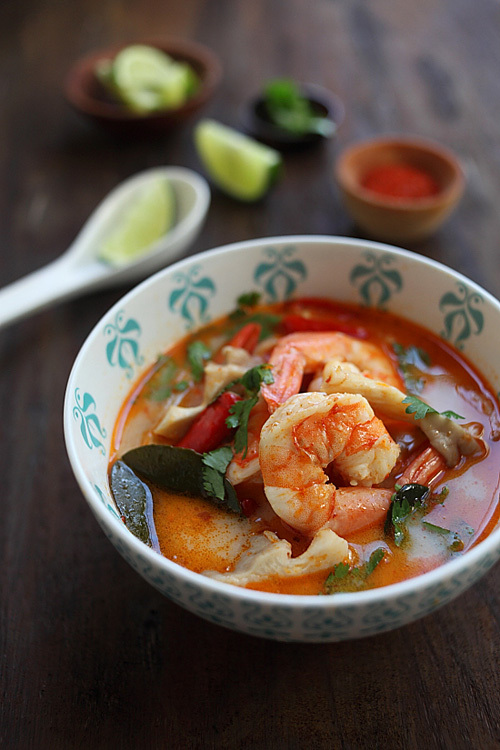 A good Tom Yum Goong must be a combination of a clear, sour soup flavored with fragrant lemon grass, fresh galangal root and kaffir lime leaf and fresh prawns. 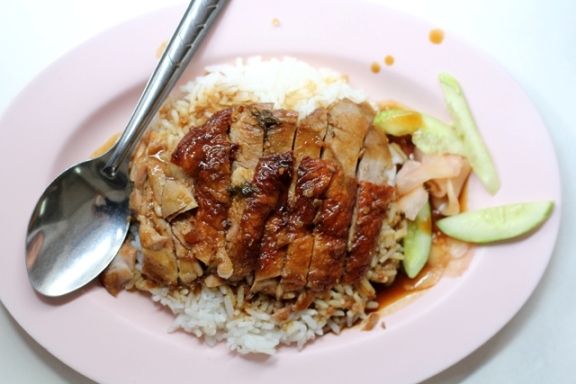 You can easily get Duck Rice / Noodles easily in Bangkok. 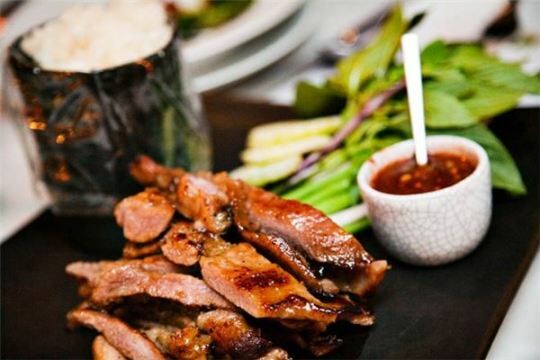 The duck are marinated and roasted to perfection with every piece of meat so soft and tender. The special sauce which goes along with it just makes everything heavenly. It is a sweet and savoury mix of sauces with certain herbs and spices. Absolutely delicious. 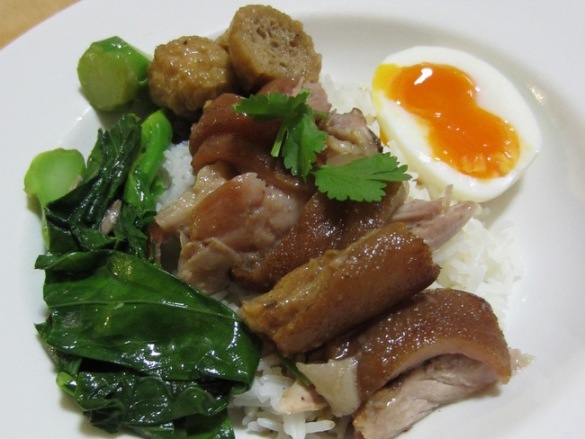 Boiled in braised sauce, the pork is tender and soft and served with rice or wanton noodle. 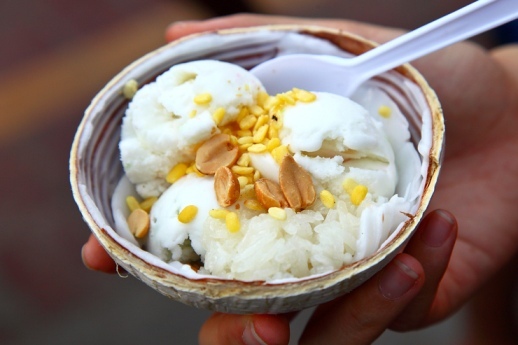 Made with coconut milk rather than cow’s milk, Thai coconut ice cream is both sweet and refreshing, and locals often take it with kernels of boiled corn or gingko biloba sprinkled on top. Mango Sticky Rice is a popular dessert in Thailand. 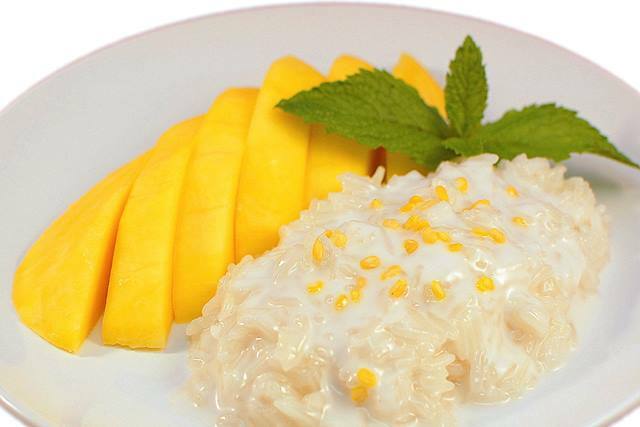 Sticky rice is cooked then mixed with sweetened coconut milk and served with fresh mango. Thai Milk Tea (Cha Yen) is the national drink of Thailand, so if you have not drink it, you can’t leave yet! Thai Milk Tea if done correctly should be sweet, milky, silky with a mixture of both tea and milk flavours. In Bangkok, chances are even the road side carts make good Milk Tea. But if you want the original, look for Number One Brand.